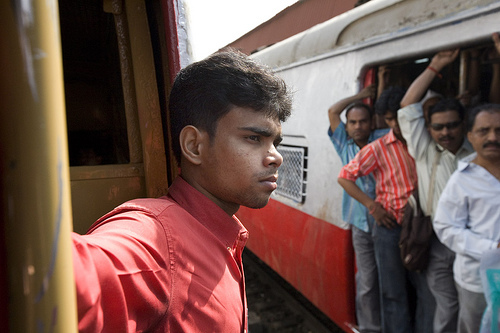 Mumbai's trains are at maximum capacity, and the motormen are feeling the sqeeze. Photo by babasteve. In the meantime, as tensions bubble, the state transport department plans to meet with top railway officials to draft a contingency plan if such a strike should arise again. The state said it will set up a committee to respond to the motormen’s demands by June 15. Besides creating conflict among railway employees, the fallout from the strike reveals a deep-seated need to create more high-quality, high-capacity mass transit services in the mega-city. Transport Minister Radhakrishna Vikhe-Patil asserted that additional buses and taxis were not enough to meet the sharp spike in demand caused by the railway strike. He acknowledged that “there is a limit to how much traffic the roads in Mumbai can take.” Perhaps now would be a good time to upgrade the city’s existing train services. On Friday, The World Bank approved a loan of Rs 1,910 crore for the second phase of the Mumbai Urban Transport Project, which will convert all suburban trains to 12-car trains, as well as increase energy efficiency along the Central line. Because of the improvements, the crowding on Mumbai’s local trains is expected to lessen by one-sixth within three years. However, infrastructure improvements alone won’t solve Mumbai’s railway woes. “We have to ensure that while procuring rakes and augmenting the services, the numbers of motormen also increase so that the city doesn’t get paralysed as it did during the recent strike,” said TC Benjamin, state urban development principal secretary.